Moms don’t always have to do “mom” things. Some moms forego the typical sports and dive right into ones that just scream “America,” and that’s OK! I might drive a minivan and have 3 boys, but we don’t play soccer. Our family competes in a different sport – one that’s very safe, very fast-paced and family-friendly. It involves running, thinking on your feet, physical and mental agility, and also, guns. Sports and road trips don’t have to be something you endure – they can be a passion, a vehicle to take your children to new places and accomplishments that otherwise might escape them. People will sometimes stare with blank looks when we are out in our jerseys and get asked if we are bikers or at fishing competition. Obviously, they’re not shooters, or they’d recognize the logos from Leupold, Winchester, etc.We explain that we shoot competitions with rifles, pistols and shotguns. And they often say, “You do what? 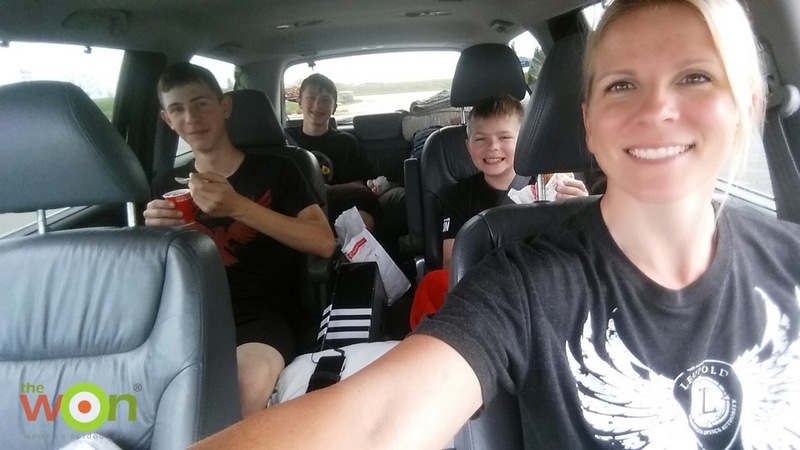 !” Some can’t believe that I take my boys alone, because my husband might be at work in his squad car or working his other job – not reloading ammo, but the Marine Corps. Growing up, I was exposed to competition shooting and hunting from as far back as I can remember. My dad still works as a gunsmith for one of the best rifle barrel makers, Krieger Barrels, and I started competing in High Power Rifle and summer biathlon and Smallbore Rifle at age 14. I kept at it with a scholarship for NCAA Air Rifle and Smallbore in college, and then when our boys were young, we did a bit of plinking and shooting at home: hunting, launching clays up on our hill and just enjoying guns when we had spare time between deployments and military moves. 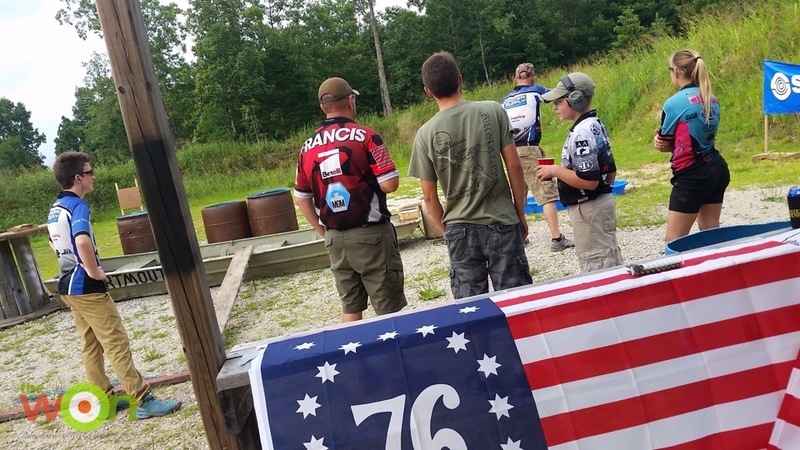 As our boys got older and we got back to shooting with the United States Practical Shooting Association, aka USPSA, in pistol and 3-gun. Our first year, 2012, we attended a few big matches and now, we have to figure out which matches to cut. Most kids compete in some sport. Our boys have been on on swim teams and wrestling, and we spent a lot of time at those events without really enjoying it. We couldn’t justify being up at 5 a.m., standing under a tent organizing heats for swim meets, but not actually spending the day with OUR kids. It seemed silly. As we started participating in more shooting matches, it felt like home to me. The sort of people I grew up around – folks you will let your kids shoot guns with, share stories with and learn from – and people who value the freedoms we have as Americans and want to spend time with each other. You could even get all philosophical about it and say it’s fellowship with like-minded people. Battle wagon has a new meaning when you load up for a road trip to a shooting match! Travel the world meet interesting people, and shoot stuff! One of the other great things about shooting, aside from the people and relationships, is the opportunity for kids to learn about other cultures. They meet and interact with people of all ages. Our eldest son and I have been on the US team for International Practical Shooting Confederation, aka IPSC, Shotgun World Shoot in Italy. In June, we will travel to Russia for the Rifle World Shoot. We have seen most of the US by car, and have 2 Honda minivans with mileage totaling more than 600,000 miles. We’ve seen a lot of America! Some of the best things though are the tough times, the teaching moments. While we sleep in our van often just to keep our travel schedule, and eat pizza for dinner – then pack the leftovers for the range the next day – we also get to see drama queens, TV shows, sweet little old men who work local matches and just love being a part of their community. Our sons learn from a wide variety of life experiences, something they can’t learn from school. We homechool, too. It worked with Marine Corps life, and it works now. It’s another very American-take on family life. If you doubt me, please read about George Washington and his education and other Founding Fathers, and you see so many were self-directed and their thirst for knowledge and freedom came from within. And that’s really all I want for my kids: to have a love of learning. Learning through experiences, good and bad, and developing the skills to blaze their own paths in life is pretty much all any parent can hope for. You must choose, choose wisely! Some of the choices that shooting gives kids are small, but such amazing opportunities to learn about themselves and their judgement and skills. First, they’re treated as adults. They compete against adults and interact with adults. They’re also given grown-up responsibility: they’re running around with guns, and have to adhere to strict safety rules, but push themselves as the same time. We might have options within a stage at a match that play to one strength or another, and seeing the boys find their own plans and push their limits and grow is rewarding, because we see that they’re learning and find it rewarding. Confidence and the ability to think on their feet are 2 of the biggest payoffs for time spent in competition shooting, and our boys are growing in those areas in ways nothing we’ve found can compare! The triumphs that come from hard work and serious effort to prepare for big events make shooting a valuable teaching tool for what it takes to accomplish goals in life! So, don’t be afraid to bring your kids to the range in their eye and ear pro. Give them very strict rules about staying off the berms, and being helpful and safe. Sure, you’ll meet the odd duck who might not be kid friendly; give your match fee to a facility and organization that is, because there are plenty out there! But for every rough experience I hear about at the range, there are a thousand good ones. I’ve seen a mother with her toddlers in car seats and safety gear running score sheets at Single Stack Nationals, and grandpa-types who mentor youngsters and are happy for the help pasting targets and carrying gear. 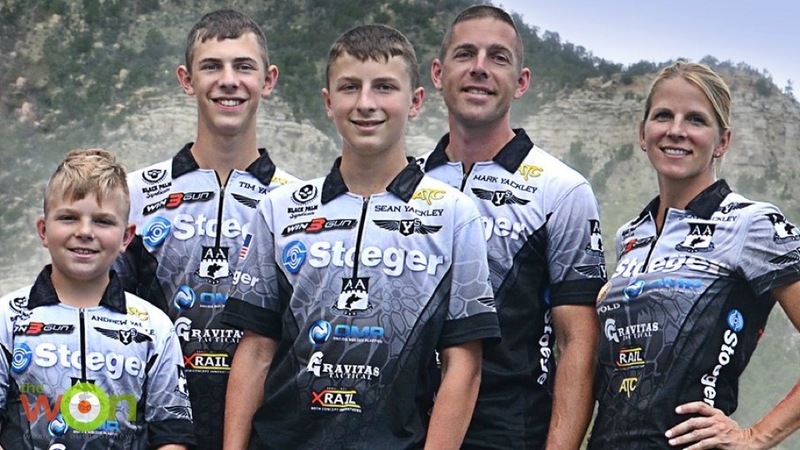 Go get your youth involved in a junior shooting camp, such as 2A Heritage or USPSA Junior programs. You’re going to see moms, like me, out there with their kids, making people realize that kids are an asset. Time volunteering at events that promote the 2nd Amendment is another reason to get kids involved in competition shooting. And learning never stops – you will grow as your children do. I just spent the weekend with a friend competing in a Nationals match and my 18- year old was more of a help to me than I was to him. 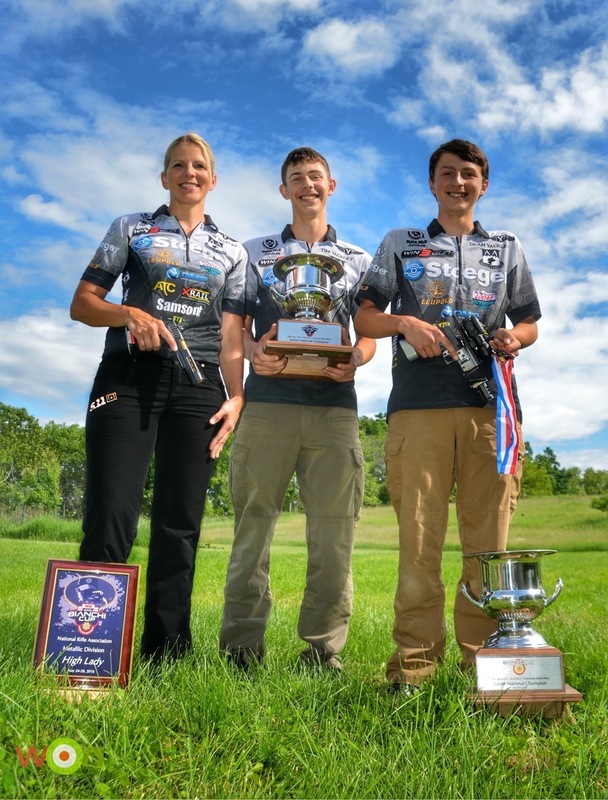 Kids aren’t just the future of shooting sports, they’re the future of society.